American Idol Judge Shake-Up: J-Lo and Steven Tyler? Ellen DeGeneres leaves American Idol, Jennifer Lopez will take her place. What about Simon Cowell’s replacement? 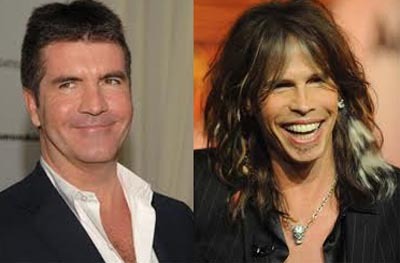 Word is it will be Aerosmith’s Steven Tyler. More here. I’m more excited about Steven Tyler than J-Lo. What a better pick Tyler is over Elton John or Howard Stern. As to Ellen leaving, it’s what she wanted. She says it wasn’t fun. She had a year left on her contract and Fox let her out early. Who would be even better than Tyler? Jon Bon Jovi, but if they can’t afford Elton John, I doubt they can afford him, and he’s committed to touring for at least another year. Will young fans think Tyler is too old or too weird? Very Possibly. Will he fit with Randy or Kara, or J-Lo? it’s very hard to picture them together. Maybe more changes are in store. 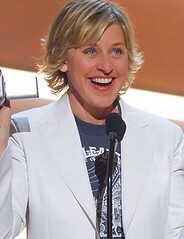 Comedian and talk show host Ellen DeGeneres will replace Paula Abdul as a judge on American Idol, beginning with the 2010 season. Why did Fox pick Ellen? I really could care less about Paula leaving or Kara DioGuardi returning. The only judge with anything interesting to say in my view is Simon Cowell. Randy Jackson and Kara are more like furniture, they lack star quality and Kara’s personality is more than a tad grating to many. That said, Paula was very popular and part of the show’s success. Unlike Kara and Randy, she has the glitz and the showmanship the show needs. And she and Simon had a good ying/yang chemistry. It seems to me American Idol wanted Paula out and they knew exactly what buttons to push to get her to make it her decision. It can’t be about money since Ryan Seacrest just got a hefty pay raise and Simon makes a fortune. We’ll see how big a blunder, if any, AI and Fox made when the show resumes. 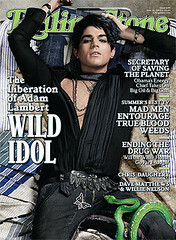 It’s official: American Idol runner-up Adam Lambert, featured on the cover and in an interview in the new Rolling Stone, confirms he is gay. He also says he had a crush on AI winner Kris Allen. Allen, totally supports Adam. And, Adam has just signed a recording contract with 19 Entertainment and RCA Recordings. His first album should be out this fall. It’s official. 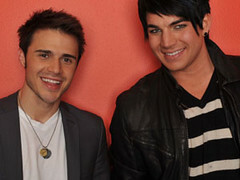 Kris Allen wins American Idol. His first comment: “Adam deserves it.” He sounds almost bummed. Adam is smiling and very congratulatory. Congratulations, Kris. To Adam: You’ll still be the biggest star of the show. Final thought: Homophobic Christians took over the American Idol ballotbox, just like they’re trying to do in real life. Sorry, but I think it’s a plausible explanation. Also, 100 million votes but the lowest ratings ever for last night’s finale. Who’s voting besides the viewers and why? The Washington Post says you can expect these questions to be batted around the water cooler tomorrow. [Kris] Allen is a married college student and has worked as a church worship leader. Gokey, a widower, is a church music director. Allen said Monday that he hoped the outcome isn’t decided by “having the Christian vote.” “I hope it has to do with your talent and the performance that you give and the package that you have. It’s not about religion and all that kind of stuff,” he said. In any event, it’s going to be a close one. Lots of performances: Lionel Richie, Carlos Santana, Cindi Lauper, Queen Latifah, Black Eyed Peas, Keith Urban, the reigning American Idol David Cook and season 4 winner Carrie Underwood. 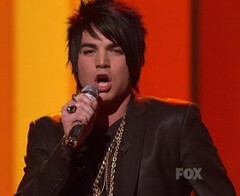 Adam Lambert and Kris Allen sing three final songs tonight. The winner will be chosen tomorrow. Adam should win, but with the pre-teen, text-message obsessed crowd going for Kris, nothing is for certain. I’ll update as the show progresses or after it.